On a general note, I’d have to say that my favorite thing about the Crossroads Trading Company is that you never know what you’re gonna find. No goodwill rummage crap here since they’re actually really picky about what they purchase to sell in store… Crossroads also has lower price points than any other buy.sell.trade that I’ve seen so far! 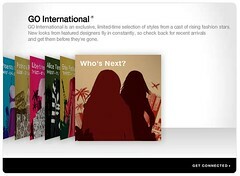 Who is Target’s next GO Designer? I walked into Target the other day to check out their GO designer for the month and what? No GO?!?! What’s going on here? So… it’s gotta be right?! wait and find out now won’t we? Hey guys! Check out this ad from craigslist! Sounds interesting hu? The producers of America’s Next Top Model and Project Runway are creating the next television show that could be your big break into the competitive world of fashion! Is fashion your passion? Have you always wanted to break into the fashion world and just need to get your foot in the door? No prior experience necessary. If you or someone you know might be interested, please forward your contact information, a recent photo, a short description of yourself, why fashion is your passion and why you think you have what it takes to make it in this competitive world to: carrieincasting@gmail.com. Casting begins in Chicago immediately, so please contact me ASAP! the list goes on… if you create… you may submit samples of your work to us! Please follow instructions. We get so much spam that we delete any e-mail that is not titled correctly. If you do not have a website yet, please attach photos of your designs to the e-mail instead. Phaiz is a small boutique where fashion and art merge. The fashion items are one of a kind produced exclusively for Phaiz, by visiting designers. Their concept also features site-specific art installations for Phaiz by visiting fine artists. The fashions and art installations are temporary. New and unique presentations are created each month. They celebrate their arrival with a festive reception held on the Friday closest to the 15th of each month. For more information about Phaiz, you may visit their website at www.phaizchicago.com. Thanks! We are looking forward to discovering new talents! Jackie addresses the inconvenient truth of global warming with this guide to green fashion that includes handbags made from candy wrappers to shopping bags made of hemp. Ask tristinstyling: What are some ways that I can style my fine short hair? What are some ways that I can style my fine short hair? Hmm… well… Watch this video and you’ll see what I mean. The opulent Newberry Library played host to Yelp.com’s first annual fashion show, Thursday evening, January 10th. Yelp.com put together all aspects of the cozy event, providing the sumptuous setting, a tasty range of passed hors d’oeuvres by Simply Elegant Catering and sophisticated wines courtesy of Night Harvest. The community website, Yelp.com, allows members to rate and review their favorite boutiques and restaurants and share recommendations. The website’s motto is “Real People. Real Reviews.” True to their word, the fashion show featured real Yelpers as models, wearing clothing from some of their favorite local boutiques including Pivot, Eskell, She and others. The show was well styled thanks to Christine Matsunaga from tristinstyling and hair and makeup by Blo Salon and Day Spa. The seated crowd enthusiastically cheered their fellow yelpers as they showed their glamorous side on the catwalk. 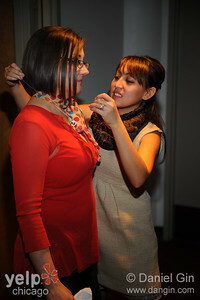 We’re giving a five star rating to Yelp.com’s first ever fashion event and can’t wait for more. Last Night’s Yelp event didn’t turn out like I thought it would… It was way better than I expected! The hall was jam packed with goodie bags for the guests, an open wine bar, and Hors D’oeuvres and Night Harvest wines served by Simply Elegant Catering. Blo Salon and Day Spa, the Hair & Make-up sponsor of the evening did an amazing job! I showed up with my strands in a ponytail and in 2 minutes, Sarah had me pinned up into a cute lil’ hive! cute!